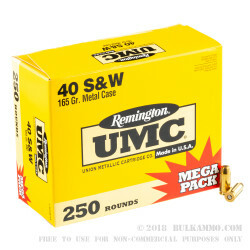 Remington UMC .40 Caliber Smith and Wesson ammunition is topped with a heavy-duty copper enclosed, solid lead core, 165 grain MC or Metal Case bullet. 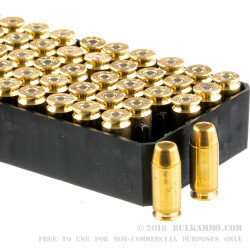 Each 165-grain bullet is carefully loaded to a specific depth into a thick walled, new, heavy-duty, Boxer primed, non-corrosive, reloadable, brass case. 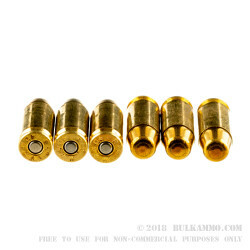 These cartridges have a muzzle energy that hits with authority at 485-foot pounds, and the muzzle velocity is a rapidly moving 1150-feet per second. 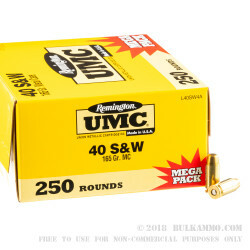 These cartridges come packed in one large easily identifiable UMC Yellow 250 round box that contains five, 50 round boxes. These are easy to stock up on and take with you on your trips to the range, any shooting competitions, plinking or target shooting with family and friends. Grab a bunch of boxes for your safe today and stack them up today! The 40 caliber Smith and Wesson round was an instant hit in the Law Enforcement community and became the go-to round for Police Departments all over the country. The .40 cal. S&W was designed in 1990 using a downsized 10mm case and originally featured a standard 180 Grain JHP or Jacketed Hollow Point bullet. Using one of their medium-smaller automatic handguns for the round, Smith and Wesson and Winchester joined forces to produce the cartridge now known as the .40 caliber S&W. Very happy and will buy again.! !